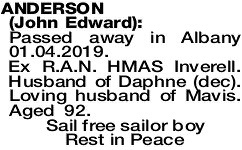 Passed away in Albany 01.04.2019. Ex R.A.N. HMAS Inverell. Husband of Daphne (dec). Loving husband of Mavis. Aged 92. 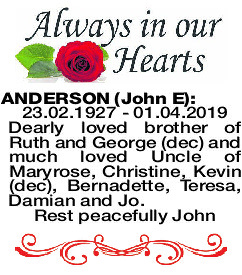 A Thanksgiving Service for the life of Mr John Edward Anderson of Albany will be held at ALLAMBIE Park Cemetery, Albany on MONDAY (08.04.2019) at 12 noon. 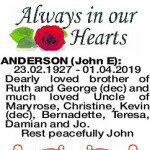 ANDERSON JOHN E 23.02.1927 - 01.04.2019 Dearly loved brother of Ruth and George (dec) and much loved Uncle of Maryrose, Christine, Kevin (dec), Bernadette, Teresa, Damian and Jo.